Congratulations on becoming an expectant mother. Mothers and their immediate caregivers are excited and also tensed because of pregnancy. Modern day medicine with good prenatal care have resulted in excellent outcomes even high risk pregnancies. The most important thing for you to understand is that pregnancy is not a disease and you are not a patient; instead pregnancy is a natural and physiological phenomenon in all forms of life. o	Good nutrition and healthy habits before and during pregnancy. o	Routine ultrasounds to detect problems with the baby. o	Monitor both the mother and baby throughout the pregnancy. o	Look for changes that may lead to a high-risk pregnancy. o	Explain nutritional requirements during and after pregnancy. o	Explain activity recommendations or restrictions. o	Discuss common pregnancy complaints such as morning sickness, backaches, leg pain, frequent urination, constipation, and heartburn and how to manage them, preferably without medications. Fig.1. 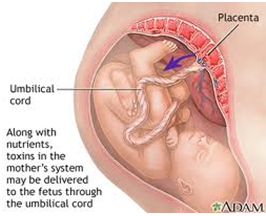 Schematic diagram of a foetus. 1. Hyperemesis Gravidarum: Many women have some nausea or vomiting, or "morning sickness," particularly during the first 3 months of pregnancy. However, hyperemesis gravidarum occurs when there is severe, persistent nausea and vomiting during pregnancy-more extreme than "morning sickness." This can lead to weight loss and dehydration and may require intensive treatment. 2. Anemia: Anemia is having lower than the normal number of healthy red blood cells.This can be helped by taking iron and folic acid supplements. Ask your doctor as to when you can start these supplements.Your health care provider will check your iron levels throughout pregnancy. -	Pain or burning when you use the bathroom. -	Fever, tiredness, or shakiness. -	An urge to use the bathroom often. -	Pressure in your lower belly. -	Urine that smells bad or looks cloudy or reddish. -	Nausea or back pain. -	A low or sad mood. -	Loss of interest in fun activities. -	Changes in appetite, sleep, and energy. -	Problems thinking, concentrating, and making decisions. -	Feelings of worthlessness, shame, or guilt. -	Thoughts that life is not worth living. Getting treatment is important for both mother and baby. If you have a history of depression, it is important to discuss this with your health care provider early in pregnancy so that a plan for management can be made. 5. Hypertension (High Blood Pressure):Chronic poorly-controlled high blood pressure before and during pregnancy puts a pregnant woman and her baby at risk for problems.The most important thing to do is to discuss blood pressure problems with your provider before you become pregnant so that appropriate treatment and control of your blood pressure occurs before pregnancy. Getting treatment for high blood pressure is important before, during, and after pregnancy. -	Having a big baby which can complicate delivery. -	Having a baby born with low blood sugar, breathing problems, and jaundice. 7. Obesity and Weight Gain: Recent studies suggest that the heavier a woman is before she becomes pregnant, the greater her risk of pregnancy complications, including preeclampsia, GDM, stillbirth and cesarean delivery. Overweight and obese women who lose weight before pregnancy are likely to have healthier pregnancies. Pregnancy lasts about 40 weeks, counting from the first day of your last normal period. The weeks are grouped into three trimesters. Fig.2. Diagram of a fetus during the (A) First trimester (week 1-week 12), (B) Second trimester (week 13-week 28), (C) Third trimester (week 29-week 40). -	Call your doctor if you have nausea, loss of appetite, vomiting, jaundice or fatigue combined with itching. These can be signs of a serious liver problem. -	If you notice any sudden or extreme swelling or if you gain a lot of weight really quickly, call your doctor right away. Doing regular physical activity has health benefits during pregnancy and also helps to prepare the body for childbirth. However, it is important to modify or choose a suitable exercise program because pregnancy affects the body's response to exercise. -	Always warm up before exercising, and cool down afterwards. -	Try to keep active on a daily basis; half an hour of walking each day can be enough, but if you can't manage that, any amount is better than nothing. -	Avoid any strenuous exercise in hot weather. -	Drink plenty of water and other fluids. -	If you go to exercise classes, make sure your teacher is properly qualified, and knows that you're pregnant and how many weeks pregnant you are. -	You might like to try swimming because the water will support your increased weight. Some local swimming pools provide aqua-natal classes with qualified instructors. -	Don't lie flat on your back, particularly after 16 weeks, because the weight of your bump presses on the big blood vessels and can make you feel faint. -	Don't take part in contact sports where there's a risk of being hit, such as kickboxing, judo or squash. -	Don't take part in horse riding, downhill skiing, ice hockey, gymnastics and cycling, because there's a risk of falling. -	Don't go scuba-diving, because the baby has no protection against decompression sickness and gas embolism (gas bubbles in the bloodstream). It is important to eat the right kind of food for a healthy mother and the growing baby. Try to incorporate 6-7 small meals/snacks during the day; this will help with nausea, morning sickness and heartburn. 1. Include lots of fresh, seasonal, local and if possible organic Fruits and Vegetables in your daily diet. 2. Add plenty of Whole Grains such as whole wheat flour, brown rice, whole beans etc. to the diet. 4. Include foods rich in Calcium, as this is an important nutrient for development of bones in the baby. Milk, yoghurt cheese, green cabbage, mustard greens, black eyed peas are some examples of calcium rich foods. 5. Your doctor might have already recommended folic acid supplements. But along with that, also include foods rich in Folate, an important nutrientduring pregnancy. Dark green leafy, vegetables, dairy products, meat, pulses and whole grains are rich sources of folate. 6. Rich sources of Iron such as meat, seafood, pulses, apples, dried figs and iron fortified foods should be part of the diet. 1. Say NO to all Sugary beverages and foods. Do not add any extra sugar to beverages like tea coffee etc. Especially important if one has gestational diabetes. 2. Refined ingredients like white rice, white flour, maida should be completely omitted from diets. Especially important if one has gestational diabetes. 3. Avoid combination of sugary and refined foods like cakes, pies, ice creams as they do the most harm. Especially important if one has gestational diabetes. 4. Avoid Unhealthy Fats such as Cholesterol, Saturated and Trans Fat. Stay away from egg yolks, cream, butter, ghee, coconut, deep fried items, whole milk, dalda, vanspati. 5. Slash down any intake of carbonated, caffeinated or alcoholic beverages. 6. Avoid spicy or acidic foods as they tend to increase heartburn. 7. During pregnancy, stay away from raw or undercooked meat and unpasteurized milk. 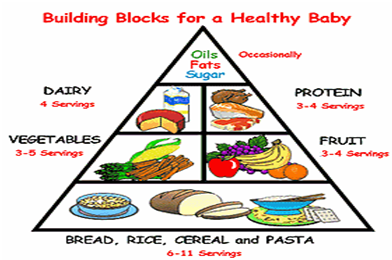 Include a variety of foods in your diet and refrain from fasting. For cooking, try to use either Olive oil or peanut oil. Eat Right and Don't forget to Exercise through your Pregnancy.